Appreciate any links or advice as to whether this is an efficient press and if there is any literature about it. 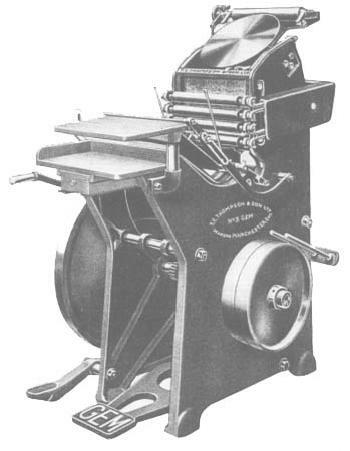 I have this particular model and it is a working press. I have to date only run test prints on her as I obtained the press in a poor state with incorrect rollers. I found it near impossible to get information on her, and so have had to adapt later thompson rollers to fit and make new trucks. As a result she only has two rollers as opposed to the four. It is also missing an ink duct,but the disk is adequate for general work. The press works fine hoever and produces fantastic prints. The adjustable bearers took a while to settle down after fitting new leathers, and the adjusters have quite a coarse thread so require only a slight turn for noticeable results. Its not the prettiest press in the world, but as I am sure you by now know, is built like a tank and seems to weigh as much. I dismantled, the press and moved it in sections, as it was too heavy to move assembled. The previous owner had just had a hip replaced, probably after years of treadling the machine, so could not assist. I had just 2 days to shift it or it would have been scrapped, so had no chance to label or make a plan for reassembley. I would love to see pictures of your machine when you are able to post, as I believe the only other example is in a museum collection in Norfolk. Hi Matt, really appreciate your response. My press was transported last month fully assembled, 300 km to where it now rests in storage awaiting the fit out of the Museum building I am to occupy. Mine has two ‘blond’ rollers only also, in good condition, so am hopeful it will run well when it comes down off its pallet. The Museum has to move a wall out of the building to get the press in, along with a Challenge Gordon as well. Suggest you email if you would like me to measure the trucks and roller dimensions of the ones I have. mbprintsolutions.co.uk. and has contact details on there. I seem to remember seeing a gem advertised in a classified advertisement, also in NZ about three years ago. The picture was not very clear so could not see if it was a No3 or otherwise. I have a few test prints that it run off just to test rollers and machine after reassembly.Only general card stock, nothing complicated but still impressive solid and crisp printing from a press that was due for scrap. If you contact with a postal address i will send to you along with some photos of press. I still have a lot of cosmetic work to do on her but she is fully functioning and I will be producing some paying work on her in the next few weeks for a local Historical Venue.